Portable partitions in the office and classroom might look overly familiar if you’ve ever dealt with isolating distractions in limited spaces. Because distractions can be a major problem for some, having a partition is going to be essential in keeping a sense of focus. Especially during the holiday season, having a partition in an office or classroom might be mandatory when some employees and students have to work rather than enjoy a party. 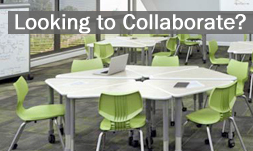 Look for various partitions that can be sound proof or hold marker boards so classes or employee collaborations can go on without interruption. They also come in various heights to avoid any temptation to peek over the top at the holiday party happening on the other side. Screenflex cubical products from Worthington Direct, www.worthingtondirect.com, make today’s cube workplace more productive and enjoyable. Here’s a short handbook about how to be a good cubicle neighbor. When walking by, refrain from glancing into everyone’s space, craning your neck to see over partitions or staring at computer screens. And it’s always bad form to hold impromptu meetings next to someone’s cubicle wall. Go to the supply closet rather than “borrow” office provisions from other people’s desks. Even though you can clearly hear others’ phone conversations, they are private. Don’t comment or ask questions about them. Leave voice mail or send e-mail when you want to talk to someone who’s on the phone. It’s not appropriate to stare at them until they hang up. Your phone is a marvelous piece of technology. Keep your voice low and you’ll still be heard on the other end. Some exuberant people must develop a softer telephone voice. Put your telephone ringer on low and do the same with your computer volume. Better yet, mute your computer. Pagers and cell phones should be on vibrate. For private phone conversations use your cell phone away from the office or use a telephone in an unoccupied meeting room. Meet with clients and other guests in a conference room or other area away from the cube farm. Give a thought as to whether your office decorations, which are in plain view, might offend someone. Try not to shout questions or regale co-workers with anecdotes over the partitions. Restrain yourself from popping gum, clipping fingernails, cracking knuckles, smacking while eating, singing, drumming fingers or nervous tapping of any kind and refreshing your cologne. Phew. Built for durability and versatility, Screenflex boasts anodized hinges; sound absorbing panels, self-leveling casters and control hinges locking panels in place. With a wide variety of fabrics, colors and sizes available, these room dividers will undoubtedly enhance and maximize the space in any office. Visit Worthington Direct at www.worthingtondirect.com to find room dividers offering your employees the best in sound diverting, visually appealing office partitions! Click here or on the picture to see and learn more about Screenflex products.